Port of Biohazard 2 made for Windows 2000 / XP. Allows both scenarios to be played without needing to change discs. Death scenes are censored in Original Mode. Translates the game into English, adds support for higher resolutions by pressing F8, adds XInput, DS3 and DS4 support, fixes some lag issues on Windows 10, fixes color space issues for the prerendered backgrounds, restores some missing audio tracks, removes censored death scenes, and allows the game to run as a portable program. Replaces the audio in the game with higher quality sounds. This is the default path used by the game. The save file location can be determined by the user by editing the SavePath value in the registry. 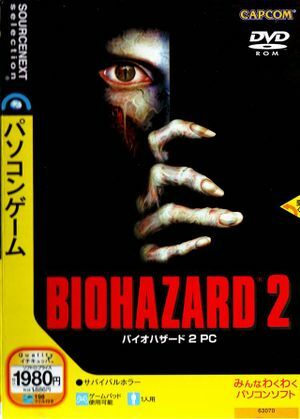 CLAIRE_MAX.BIOHAZARD2 and LEON_MAX.BIOHAZARD2 are required to start a new game. Borderless Gaming or Gemini's patch can be used. Use Gemini's patch to add support for XInput controllers. Use Gemini's patch to add XInput button prompts. Use Gemini's patch via USB to add support for DS4 controllers. Use Gemini's patch to add DS4 button prompts. Use Gemini's patch via USB to add DS4 light bar support. Use Gemini's patch for English text. This is generally caused by DirectShow codecs on Windows 10 being incompatible with Nvidia desktop drivers. Versions such as Windows XP do have the codecs to run the cutscenes with no issues. Gemini's patch makes FMV work again by replacing DirectShow with FFMPEG.